It is very common for entrepreneurs and businesses to obsess and focus solely on website design; however, we encourage an equal emphasis be placed on its performance and user experience. These critical factors are often overlooked, but have a significant impact on the success of a marketing campaign and subsequent earning potential. Salon equipment supplier, Salon CA came to us for a website design, but had a usability and experience problem that needed resolving. The fast paced lifestyle of many Americans has created a customer expectation that demands instantaneous results. Technological advances such as push-start car ignition and LTE connectivity speak to the instant gratification mindset. Modern solutions encourage and facilitate this pace, which lead to an impatient customer that expects convenience and speed. Online sales of your business will suffer if your website speed lags in the slightest bit. In this post, we will explain the process of analyzing and implementing a solution to the website speed issue that was impeding the bottom line of Salon CA. Following the launch of their newly designed site, Salon CA initiated a brand new Pay-Per-Click marketing campaign. The goal was simple – sell more of their affordably priced salon supplies and furniture. 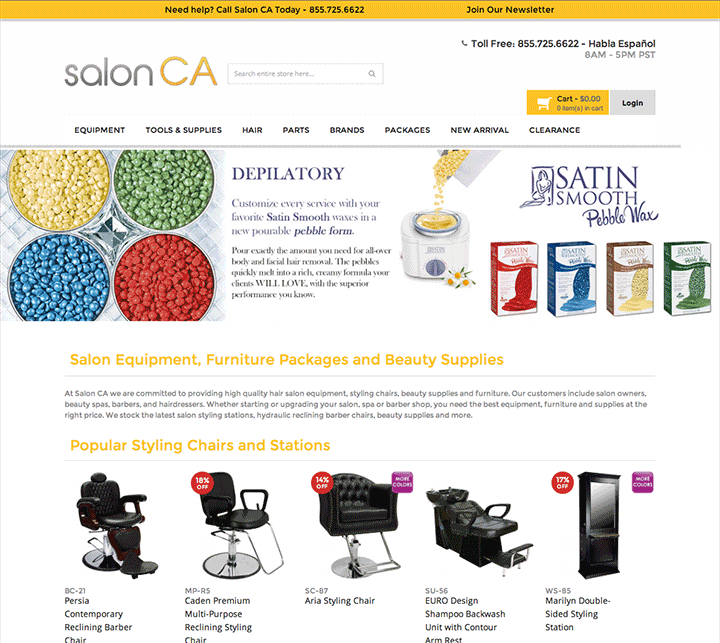 Salon CA has a large inventory of equipment, so it took a few weeks to add all of their products to the Ad network and be promoted across the Internet. Every business owner understands and wants more eyeballs on their website. However, the larger goal is that these visitors turn into paying customers. And despite the spike in traffic, conversions and actual sales were only marginally better. We had an idea as to the source of this problem, but needed to look under the hood to confirm our suspicion. We performed an audit of the Salon CA website traffic by studying the browsing behaviors of their website visitors. These potential customers were being attracted and driven to the site primarily by the Google Shopping network. The Google users typed a query (example – barber chair) and were shown images of barber chairs from several different vendors. Below the barber chair product images were the price and business name. Thus, the behavior of this customer was that of someone looking for a company with the product they needed, at the right price, and with a company policy they were comfortable buying from. The visitors that saw the factors that made them comfortable clicked the “Add to Cart” or “Buy” buttons. We saw in the analytics that website users were leaving the site or abandoning the cart before finishing their transaction. Every buyer has to know the price range of a product that they are willing to pay. There are several pricing strategies that can encourage buyers to take action, but that’s not the only consideration of a buyer. User experience can be broken down into several bite-size pieces, some of which include a retailer’s refund policy, the prestige of owning a brand’s product, or the actual process of making the transaction. All buyers consciously and unconsciously consider these factors when shopping and “interviewing” the retailer they will choose to satisfy their product fulfillment needs. Understanding this information, we knew that if customers were coming to the site after having a preview of price, then it was likely in line with what they were willing to pay. With that off the list as the issue, our focus went to the other conversion factor. When evaluating the “experience” aspect of the Salon CA website, we looked to the main technical factor that affects the entire website: the hosting server. The Virtual Private Server that hosted their 3000 SKU product line of furniture and equipment was hosted on the Bluehost network. In many situations, Bluehost is an ideal and very reliable hosting solution; however, after testing the Salon CA website environment, we learned the hosting server response and load times were less than desirable. This aspect was potentially driving customers away due to a poor shopping experience. The Salon CA website was built on the widely popular Magento platform. This e-commerce application is a great product that is used by top brands and enterprise level companies. It is extremely robust; however, Magento is a known resource hog. Our page-load auditing was showing load times of nearly 5 seconds. In a culture where decisions are made quickly, every second counts. The load speed problem was not due to their hardware or technical limitations; it was in lacking human capital. The Bluehost Virtual Private Server was unmanaged and had not been optimized in any way. We optimized the website, files, and database with HTTP headers, caching and other speed improvement; however, without a network administrator, their Bluehost VPS was nearly out the box without any optimization. We communicated the issue and began looking for a managed hosting environment. After looking at the array of web hosts, we stumbled on a Magento optimized managed hosting solution named Nexcess. All technical requirements were met and reviews of other webmasters gave us the confidence to present this as the solution to the problem. Next, we coordinated a call with the Nexcess sales team to address technical questions and concerns. The Nexcess representatives were very polite, knowledgeable, and seemingly a good fit for our needs. We were provided the link to a Demo Magento website that was being hosted on their managed and optimized Magento hosting environment. The speed of browsing their Demo website was noticeably fast. Most importantly, the “Add to Cart” and checkout function performed exceptionally well also. We were seeing 2-3 second load times on average, and compared to the original Salon CA 5 second load time, this met our needs. We confirmed with Salon CA that Nexcess was our choice provider and solution to their website issue. Included in the Nexcess plan was Email Hosting, Redis Cache, Free Migration, and SSL, amongst other perks. The plan totaled around $80 a month for 125 GB bandwidth, and included free backups and other security features. Once signed up, we provided the Nexcess development team the necessary credentials and they went to work. Their team backed up the current website, database, and all files. Once transferred to the Nexcess server, we were allowed to test the site in the new hosting environment. After 2-3 weeks of testing and SSL setup, the new Salon CA website went live. As soon as the DNS propagated and the Salon CA website loaded from the new host, we immediately saw the speed and user experience improvement. Now with less than 2 second load website load times, it was time to put the new solution to the test. We resumed PPC ads on the Google Shopping network, inviting traffic and customers to the new website. The moment we all waited for – was this the answer to the problem – was here. Per the new analytics, traffic to the site was increased with our upgraded experience. The Number of Pages Per Visit increased which let us know visitors appreciated the speed improvement and were compelled to visit more pages / products. Our Quality Score also improved, which meant better Ad placement, cheaper Cost Per Acquisition, and reduced Cost Per Click (Ad Spend), resulting in greater profitability and revenue. Last but not least, conversion rate exploded 580%. The proof was evident: faster website load speed was the solution to better conversions. Potential customers became actual customers and rewarded Salon CA for improving their user experience. Find Salon CA on G+ or Facebook, and visit the faster and improved Salon CA website.